There may come a point in time when you decide that you want to breed your Yorkshire Terriers. Hopefully, before you start breeding in a helter skelter fashion, you’ve taken the time to learn as much as possible about the breed, and you have also had mentoring from a successful breeder. If this is the case, you obviously need a male and female Yorkshire Terrier. Before you breed these dogs, you will have them checked out thoroughly by your veterinarian, and there will be numerous medical tests performed to determine if these dogs have any genetic defects that may be passed on to their litter. With a clean bill of health, there are other factors that you must consider. Ideally, good breeders breed Yorkies that have matched temperaments, and those temperaments are pleasant. You should avoid breeding Yorkies that are nervous, shy, or aggressive, as these traits can be passed onto the litter as surely as a genetic defect can be passed on. Finally, the male and the female must actually get along well together, or you will most likely not be successful. Not every Yorkshire Terrier should be bred, and not all can legally be bred. 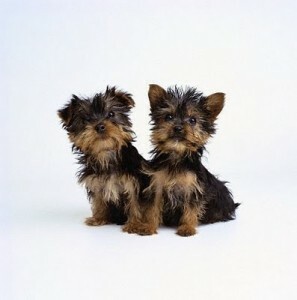 When you purchase your Yorkshire Terriers, they may already be spayed or neutered. A good breeder will alter Yorkies who are not championship quality. They will also alter Yorkies for which the new owner has not purchased the breeding rights. The breeders who use these practices are not trying to corner the market on Yorkies. The fact is that a responsible breeder will not give breeding rights to just anyone, or to just any Yorkie. You may think that your Yorkies can be bred – or should be bred – simply because they are registered, and they do have a pedigree. While these are necessary for breeding purebred Yorkshire Terriers, it does not mean that the dogs should be bred. Just because a dog has a pedigree, it does not mean that he has the qualities that are absolutely sought in the breed. Expert breeders breed their dogs in an attempt to improve the breed. Many people mistakenly think that there is money to be made in breeding Yorkshire Terriers. These dogs do have a high price tag, but in reality, there isn’t any money being made by responsible breeders. The high quality breeding stock will cost a pretty penny, and taking care of them and their litters will also eat into those expected profits. A good breeder keeps the puppies for about three months of their lives, and during that time, these puppies will have veterinarian care, vaccinations, may be spayed or neutered, and will often be microchipped – all at the expense of the breeder. Breeding also takes up a great deal of time, and a good breeder must be absolutely dedicated to the Yorkshire Terrier breed. The dogs and puppies must be cared for and cleaned up after, but they must also have love and attention from humans for the purpose of socialization. When the puppies are ready to be sold, a good breeder will actually interview prospective families to place the puppies in good homes. As you can see, there is a great deal more to breeding than putting a male and female together and then running an ad to sell the puppies. Don’t fall into this trap. Take the time to get mentoring from a successful Yorkshire Terrier breeder first.